CHICAGO — Hillary Rodham Clinton’s presidential campaign will center on boosting economic security for the middle class and expanding opportunities for working families, while casting the former senator and secretary of state as a “tenacious fighter” able to get results, two senior advisers said Saturday. They provided the first preview of the message that Clinton planned to convey when she launches her long-anticipated campaign on Sunday with an online video. Until now, the former first lady has offered only hints of what would drive her if she were to run a second time for the White House. The strategy described by Clinton’s advisers has echoes of President Barack Obama’s 2012 re-election campaign. He framed the choice for voters as between Democrats focused on the middle class and Republicans wanting to protect the wealthy and return to policies that led to the 2008 economic collapse. 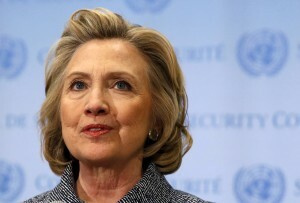 The advisers said Clinton will argue that voters have a similar choice in 2016. Clinton also intends to sell herself as being able to work with Congress, businesses and world leaders. That approach could be perceived as a critique of Obama, Clinton’s rival for the nomination in 2008. He has largely been unable to fulfill his pledge to end Washington’s intense partisanship and found much of his presidency stymied by gridlock with Congress. The Clinton advisers spoke on condition of anonymity in order to discuss her plans ahead of Sunday’s announcement. People familiar with the plans say Clinton will travel to Iowa and other early-voting states to hold small events with residents in the days after the video’s release. Clinton is not expected to roll out detailed policy positions in the first weeks of her campaign. Advisers said she planned to talk about ways families can increase take-home pay, the importance of expanding early childhood education and making higher education more affordable. It’s not yet clear whether that will include a noticeable break with Obama on economic policy. The GOP has hammered Obama’s approach as anti-business and insufficient in the wake of the recession. The White House says the economy has improved significantly in recent years. The unemployment rate fell to 5.5 percent in March, but manufacturing and new home construction slowed, cheaper gas has yet to ignite consumer spending and participation in the labor force remains sluggish. Clinton will enter the race as the overwhelming favorite for her party’s nomination. Still, her team has said her early strategy is designed to avoid appearing to take that nomination for granted. The early events will include discussions at colleges, day care centers and private homes, and stops at coffee shops and diners. After about a month of such events, Clinton will give a broader speech outlining more specifics about her rationale for running. In 2008, Clinton followed a video announcement with a large rally in Des Moines, Iowa. Clinton’s husband, Bill, and daughter, Chelsea, are unlikely to appear at her early events. Bill Clinton, the former two-term president, said recently that he wanted to play a role as a “backstage adviser” in his wife’s campaign. Advisers said Bill Clinton has been engaged with his wife in some of the policy discussions leading up to this weekend’s rollout. To prepare for the campaign, Clinton has spent months meeting with economic policy experts, including Heather Boushey, whose research focuses on inequality, and Teresa Ghilarducci, a labor economist and retirement policy expert. The policy development process has been overseen by aides Jake Sullivan and Dan Schwerin. In the days before her announcement, Clinton has been holding lengthy meetings with her staff, sometimes joining them at her crowded personal offices in midtown Manhattan and other times participating by phone. Clinton’s growing team of staffers began working out of a new campaign headquarters in Brooklyn on Friday. She is expected to reach out to donors in the coming weeks, but does not plan to headline many fundraising events over the next month.